Every Triumph Spitfire has a story to tell, and here are some highlights from my time with this fine car. The sleek body would turn heads everywhere. 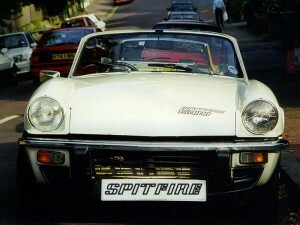 My Triumph Spitfire shortly after I bought it. 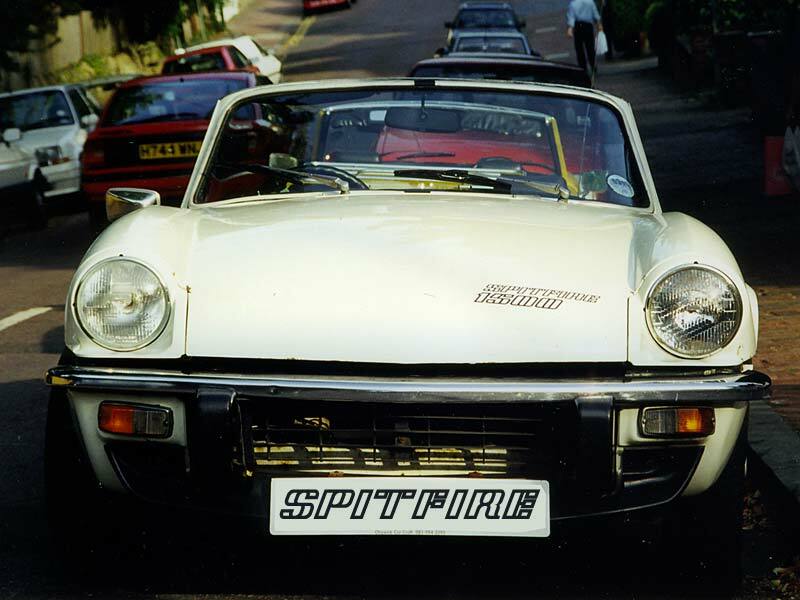 My Triumph Spitfire 1500 was registered in Reading, Berkshire on October 1975. This date and its commission number place it relatively near the start of the 1500 mark, which was the 5th and final mark. See the Triumph Spitfire Production Dates page for a full breakdown of when the various marques were made. I bought the car in Summer 1998. It was originally painted White with black trim around the distinctive ‘Stag back end’ and along the top of the bonnet.I had it resprayed in March 1999 to it’s current Carmine Red – seemingly a popular colour for Triumphs. See the Bodywork Restoration page for more details on that. The car has had owners in Reading (Berkshire), Chiswick (West London), Walton-on-Thames (Surrey) and whilst I had it you could see it round the streets of Woking in Surrey. I was the 5th owner and the car had done 116,000 miles when I sold it on what I believe is the original engine (albeit with an unleaded head) and gearbox. I sold the Spitfire in 2002 to an owner who lived in Sussex. I was contacted in 2003 by another person who then owned it – another new owner. I have no idea now whether the car still exists but I have checked fairly recently on an online insurance quote site and the make and model popped up when I typed in the registration number. Kenlowe Fan in front of the radiator.This was a tricky photo to take but it shows the new radiator, Kenlowe electric fan, and a nice clean replacement radiator expansion bottle. (The air intakes for the carburettor intrude menacingly top left). 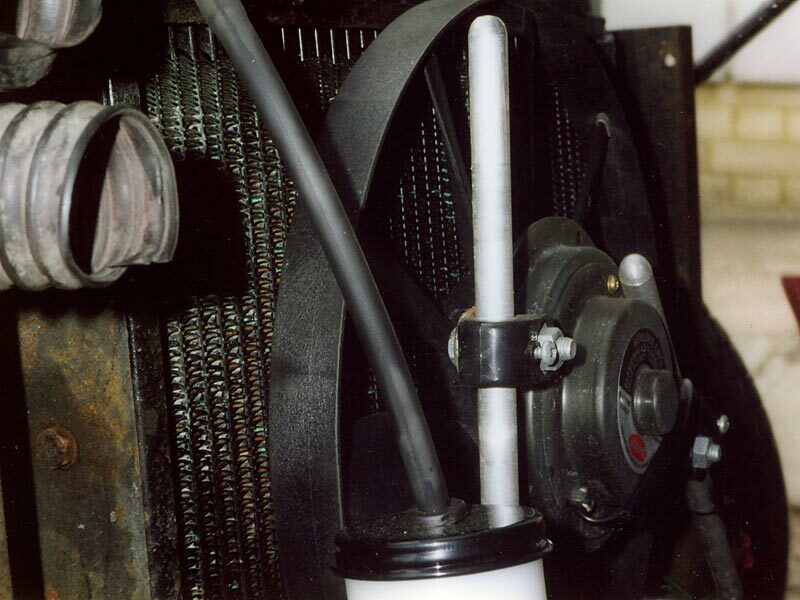 Kenlowe Fan in front of the radiator. This was a tricky photo to take but it shows the new radiator, Kenlowe electric fan, and a nice clean replacement radiator expansion bottle. 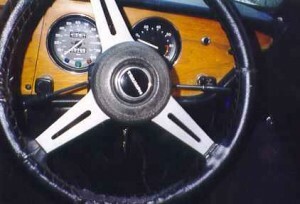 (The air intakes for the carburettor intrude menacingly top left). Conversion to lead-free petrol with a new TSSC cylinder head – producing a definite improvement in fuel consumption.